Addison (my "home" airport) may be small, but that doesn't mean it's boring. For a single runway suburban airport it offers quite a few things to do with your free time. They have an impressive collection of vintage planes including WWI, WWII, Korea, and Vietnam era warbirds. Nice day? Do some spotting (meet your quota!). During weekdays there is a fairly constant flow of arrivals and departures of both piston and jet private planes. During airshow season try to catch the various airworthy museum birds coming and going. 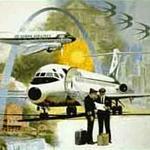 Or, keep an eye out for a few rare commercial jets like Ameristar's DC-9s and 732s (Their headquarters is here). Also, another rare 737-200 has been hanging around lately. If you have a car or, hell, even a bike, take a ride around the airport and you'll find a handful of places to take some photos. One of my favorites is the small park with large, round hills at the southern end, just under the approach. Park at the tiny lot on the NW corner of Addison & Arapaho and cross the street. Landing jets are within rock-throwing distance and the hills provide views of the airfield even if train cars are parked in front of you. P.S. this area gets heavy Police traffic due to the station on the East side of the airport. I haven't been hassled like at the major area airports and it's good to know I'm safe with my camera gear (sitting on top of a hill for everyone to see as they drive by). There are also other places to go, some riskier than others, to watch or photograph. The airport is ringed in by businesses, so find one that has a public parking lot facing the action and don't be a nuisance. The north end of the airport has a long lot that is nice, but views are of the airport only (buildings block the view north). Keep in mind Addison has roughly 15.4 million places to eat if you get hungry. There is also a sports bar on the SE side called The Outer Marker. If you go let me know what it's like. That's about all I can think of. Have fun and good luck. Let's not forget, any trip to Addison, or anywhere in N. Dallas, has to include a stop at The Londoner! My personal favorite restaurant in DFW. Greg wrote: Let's not forget, any trip to Addison, or anywhere in N. Dallas, has to include a stop at The Londoner! My personal favorite restaurant in DFW. Bangers and Mash to die for. I'll have to go try out The Londonder, sounds like a fun place to make a visit. Of course, I'm a huge fan of Freebird's and there is one just directly across the street (south) from the Hooter's up there. Here is some info on that 737 that comes in there from time to time. Also, I think it is either Midway or Marsh that runs parallel to the runway on the west side, I wonder if that would be a good place for spotting the activity of Addison? I've flown in and out of there one time, on a prop plane. My friend, the pilot, had a very difficult time finding the airport at night, due to all the lights surrounding the airport. I was the one who spotted it first.